One of the biggest pike the author has boated to date, when trolling and also for some faster cast and retrieve baits like this ducktail, a leader isn’t usually necessary because the bait is big enough that even trophy fish have a hard time getting the entire lure in their mouth. 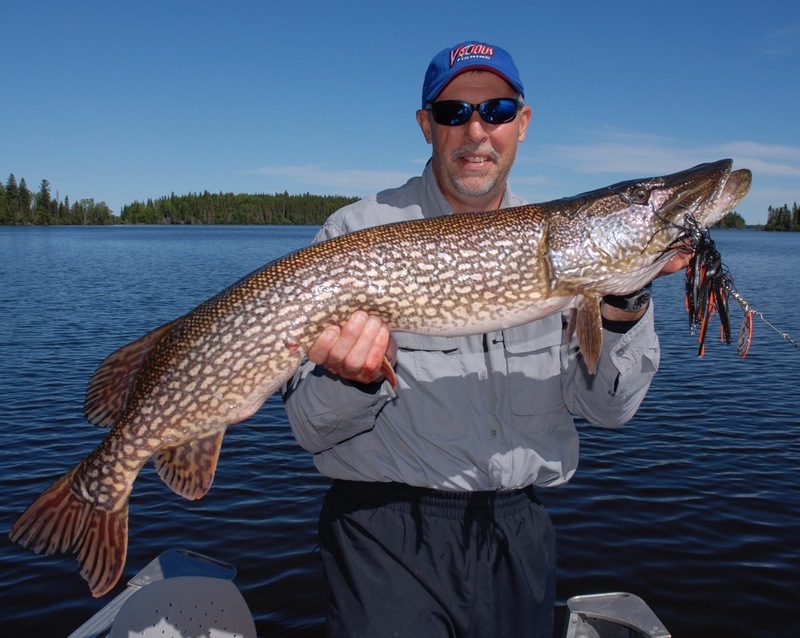 Anyone who has encountered the northern pike or musky has also encountered the dreaded “bite off”, so common when these fish come unglued on a bucktail, jerkbait, jig or spoon. Combine a bone jarring strike with a mouth full of dagger-like teeth and it’s no wonder anglers everywhere have openings in their tackle box where their favorite lures used to be. 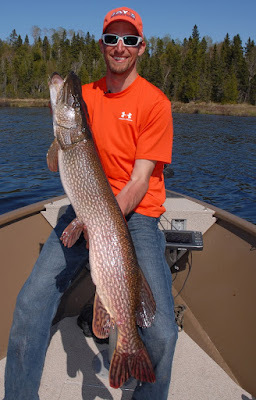 Not only do pike and musky have a major case of overbite, they can bite through just about any fishing line short of steel wire. No doubt this is why the common coated steel leader is considered standard equipment by many anglers who venture into esox country. Wire leaders prevent “bite offs”, but they can also prevent a lot of strikes from happening in the first place. If not using a leader means fish lost to “bite offs” and using a leader means no bites, what’s an angler to do? The answer depends a lot on the lure type and presentation involved. For certain pike and musky fishing methods a leader isn’t necessary and for others it’s almost mandatory. Understanding when to use leaders and what types work best with various lures and fishing presentations is the fast track to Esox fishing success. When is a pike or musky leader not necessary? The quick answer is a leader isn’t necessary in most crankbait trolling situations. Usually when trolling with crankbaits pike and musky are lip hooked. This happens in part because a fast moving lure on a steady course is hard for a pike or musky to fully engulf down their gullet. Most of these fish caught while trolling have the lure lodged firmly in their mouth, but not buried so deep the fish can shear off the line. Also, pike and musky sized crankbaits are more than a mouthful even for big fish. Simply trolling with larger lures will prevent 99% of “bite offs”. Other smaller lures like in-line spinners and spoons are also very susceptible to “bite offs”. Fishing without a leader with any bait that’s small enough to easily fit inside a pike or musky mouth is like playing Russian Roulette with all the cylinders loaded. prevent “bite offs” is often necessary, but not in all fishing situations. The type of retrieve used is also a factor in how many “bite offs” are likely to occur. A hefty spinnerbait or magnum sized bucktail spinner that’s casted and retrieved with a steady cranking motion is fairly safe from the teeth of these predators. Other lures like jerkbaits or topwater plugs that are fished in a start and stop motion are sitting ducks and almost certain to suffer from “bite offs” if precautions aren’t taken. Anglers will find a host of leaders designed to make pike and musky fishing a happy affair. For fishing techniques where the risk of “bite offs” is lower fashioning a 18 inch long leader from 50 to 80 pound test fluorocarbon line is a good option. Fluorocarbon is flexible, holds knots well and has enough abrasion resistance to turn back the teeth of pike and musky in most situations. Tie a ball bearing swivel on one end of this leader and a heavy duty snap on the other end. Presentations that require a little more “bite off” protection require leaders made of titanium wire. Titanium wire is thinner than coated wire and also resists kinking when a powerful fish is hooked. A number of manufactures produce titanium wire leaders designed with toothy critters in mind. For the maximum in “bite off” protection anglers may want to consider heavier wire leaders known as “jerkbait leaders”. Normally these are made of a much stiffer single strand wire and are used for fishing jerkbaits to target monster musky and trophy class walleye. The way to beat the teeth of pike and musky is to match up the right leader with the right lures and presentations. Understanding the basics of leader technology can just about guarantee that when Mr. Big decides to bite, the experience will result in a thrill not a disappointment.